Measurements: 2.75 x 4.72 inches; or 70 x 120 millimeters. Back of card: Dark sky blue with hundreds of tiny stars densly packed in. Around the edge, a turquoise border. Not exactly symetrical, but can easily be inverted. Booklet included: Yes, small, 102 pages, 2.7 x 4.65 inches, or 68 x 118 mm. Text by Mario Montano. Major Cards are universal archetypes of human experience, based on the life and teachings of Jesus Christ. These cards have Roman numerals at the top. Minor Cards are "oracular" in form, based on 40 short saying of Jesus. They offer specific insight, give advice, suggest attitudes, propose solutions, provide answers. Each of these cards has an Arabic numeral (eg, 4, 5, 6, etc.) at the top. People Cards portray sixteen men and women, sixteen "icons", each expressing a type of person. They represent people in the life of Jesus, as well as reveal different parts of the Questioner. These cards are unnumbered. 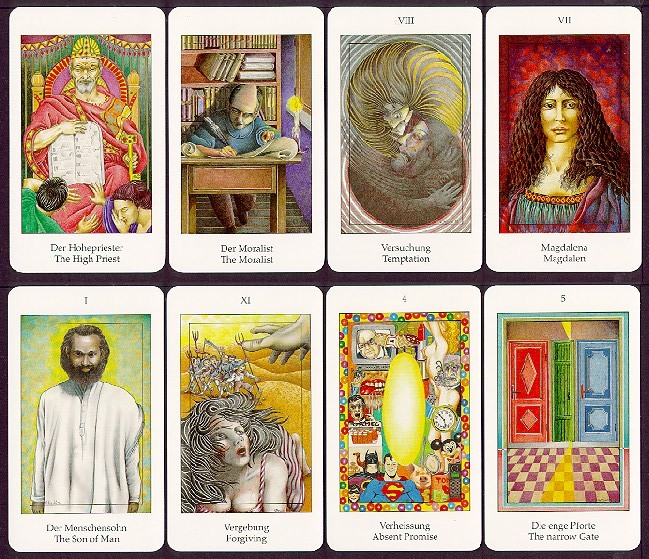 There are examples of all three in the eight cards above. A not very Christian friend got this deck from us & reports it quickly became a favorite. We can see why. The three part format is easy to understand, and the cards gently suggest, they do not preach or condemn. And they're refreshingly unstuffy. We have only one personal note, and it's on the 4 card, "Absent Promise". It's intended to show the emptiness of pop entertainment, and it does so, but it has one interesting feature: Superman, on the bottom edge of the card. It's our belief that the DC Comics Superman is himself a stalking horse for the Second Coming, which is too long and abtruse a story to go into here. But it is a reminder that we bring ourselves to the cards, that to each of us the cards will have a different meaning. This is the genius and the terror of tarot, make of it what you will.